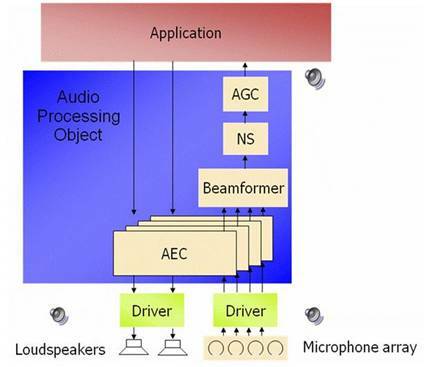 Microphone array recording is a technique for improving recording quality by processing signal from multiple microphones. Compare the signal, and you can more easily focus in on the source. The application here is really not music and “pro audio” — in this case, I think they’re targeting consumer-grade mic arrays that would replace, say, the lousy built-in mics in laptops and webcams. It does sound very useful, that said, and I would be interested to know about any “pro” applications that do exist for this sort of thing, beyond making podcasts and Skype chats work better (which is a worthy thing, and something I myself use). But here’s why you should care, even if you don’t really care: in Windows XP, a lot of these sorts of functions were handled by device drivers instead of the OS. That could wreak havoc because of the low-level function required for tasks like echo cancellation. One particular third-party vendor (cough, Logitech, cough!) was shipping XP drivers for its webcams with echo cancellation turned on by default. It caused all sorts of problems, disabling pro audio hardware interfaces without warning and even nasty Blue Screens of Death (at least in my experience). It could entirely disable your music setup until you turned it off. Now, some might say you should have a dedicated machine for audio production, but that ignores the reality that lots of third-party, consumer hardware plays just fine on the same machine. That’s part of what’s great about using computers for music. So, clearly, this unnecessary chaos could be avoided. A third-party provider of microphone array technology will generally embed this functionality inside the audio device driver. However, if the microphone array functionality is performed inside the audio device driver then the signal sent to the Acoustic Echo Cancellation (AEC) component in Windows Vista is unable to perform the echo cancellation effectively. Ah, there we have it. Now that audio processing functions in Vista have been handed over to the OS, you really do need, as he puts it, an “end-to-end” solution. Translation: you may never need a mic array, but at least Microsoft is keeping ill-behaved device drivers out of your way so you can get work done. And that seems to me to be a very good thing. In general, all three OSes (Linux, Mac, and Windows) could likely improve overall stability and reliability by better supporting some of these kinds of functions out of the box. That said, this does sum up some of my frustration with Vista for audio: anything having to do with consumer products got top priority in the new audio features in the OS. Anything having to do with real-world recording and music production seems to have been left off the table. So we’re left with yet another Windows OS that doesn’t handle USB audio and MIDI devices correctly, still has various Registry glitches, still requires ASIO drivers for most devices (with a few new exceptions), and still has no built-in facility for routing MIDI and audio between applications. Never mind that the whole “glitch-free”, later “glitch-resistant” promises about audio never really seemed to materialize. I’m at least hopeful that SP1 will iron out some of the reliability issues with Vista, but ironically, part of the reason that’s likely is that Microsoft is delaying fixes to known problems until that release. New MacBook Pros Don’t Power (Some) FireWire Devices?